Despite a seemingly annual hosepipe ban in the UK, a decent garden hose is always an important tool in your gardening supply shed. But you can’t just go and buy any old hose. There are tons to choose from, and lots of different options. So how do you go about buying the best garden hose for your property? That’s what we’re here to help you with, and we’ve even included some great model recommendations too! Sure, you can water your garden with a watering can. But if you’ve got anything other than a small balcony garden, a garden hose is going to be essential. A hose will let you water your garden quickly and efficiently, a real time saver if you’re used to using a watering can. Plus, a hose is useful for other things too. From cleaning off muddy bikes to filling the kids’ paddling pool, every garden needs a hose. These kinds of hoses are generally made from cheaper materials and thus are a budget-friendly option. However, they’re not especially durable, and they can kink and/or break relatively easily. But if you’re looking to save, then a light or medium duty hose is going to be your best bet. Pros: Very affordable, come in many different lengths, light and easy to manoeuvre. Cons: Not very durable, the material tends to harden and crack over time, kink easily. Best For: Those on a budget, and those that don’t use a garden hose every day. Heavy duty hoses are made from higher quality materials, meaning they’re likely to last a lot longer than light-duty hoses. However, these materials do make heavy-duty hoses heavier and more unwieldy. You’re likely to find more special features on heavy-duty hoses too, such as the ability to expand or anti-kink technology. Pros: Durable and long-lasting, many have extra features. Cons: More expensive, heavier and more difficult to move around. Best For: Those with larger gardens where anti-kinking is important, those that use a hose regularly. Soaker and sprinkler hoses are designed for garden irrigation. A sprinkler hose has many small holes along the side and can be laid out above ground to effectively water large areas. A soaker hose is made from a porous material and is buried underground or in mulch where water can leak out of the hose into the ground. These are both quite specialist options and aren’t right for every garden. Pros: Make watering large areas very easy. Cons: The hose can’t be used for general garden duties, such as watering different flower beds, or for other things like washing the car. Best For: Those with a large garden that need to water large areas and that have another, regular garden hose as well. Finally, there is one last option and that’s commercial or contractor grade hoses. These are generally very robust and heavy and are meant for professional gardeners. You probably will not need this kind of hose for your home garden. If you are tempted to go for a professional hose, be aware that they often have different connectors, meaning they may not fit on your regular garden tap. You’ll need to double check this before buying. Pros: Very long lasting and durable. Cons: Heavy and expensive, connectors may not fit traditional garden taps. Best For: The pros. It’s highly unlikely that a home gardener will require a commercial grade hosepipe. Expandable garden hoses are relatively new on the market, but they have a lot of advantages. An expandable hose has two layers. The inner layer is usually a stretchable form of rubber, whilst the outer layer is nylon. The hose expands to around three times its original length when water is turned on and shrinks again when water is turned off. An expandable hose is generally kink-free and much lighter than a traditional hose. This can be a good option if you’re low on storage space. Not all hoses are rated to be used with hot water. If you’re planning on running hot water through your hose (perhaps to wash your car) then you’ll need to look for a hose that has a hot water rating. Cheaper, lightweight hoses tend not to be rated for hot water, and you risk the hose splitting or even melting should you choose to use hot water with them. And not all hoses are rated for drinking water either. This could be a problem if you plan on having your kids play in the hose, or filling their paddling pool with it. In general, rubber and some PVA hoses are rated for drinking water, but with other materials, you risk chemicals leaching into the water making it unpotable. Finally, many hoses are advertised as “anti-kink,” but these really vary in efficacy. When your hose kinks, water no longer flows freely and the hose can burst or split. In general, heavy, more rigid hoses are less prone to kinking. As we said though, despite many hoses being sold as anti-kink, not all of them are, and you’ll need to read customer reviews to find out if those anti-kink claims are true. The exception to this is expandable hoses, which are all anti-kink due to the nature of their materials. Length: You want a hose that’s long enough to reach the far corners of your garden, but too long and you’ll risk unnecessary kinking. The rule of thumb for length is to measure from your garden tap to the furthest point in your garden and then add ten feet. PSI: PSI is the amount of pressure that a hose can take without splitting or breaking. Cheaper hoses tend to be rated at around 200 PSI, whilst serious heavy duty ones can go up to 600 PSI or more. For the average home use, you should be looking for around 350 PSI to avoid unnecessary breakage. Connectors: Most hose connections are standardized these days, with the exception of commercial grade hoses. Still, it’s always best to double check that the connector on the hose you choose will fit your garden water source. If possible, opt for metal connectors over plastic, since they’ll be more durable. Diameter: Hoses come in plenty of diameters, from around 3/8’’ to 1’’ (and are nearly always measured in inches). The wider a hose is, the more water it outputs. For average home use, 5/8’’ is standard. If you choose wider or smaller than this, do make sure you double check that the connectors will still fit your garden tap! Material: A vinyl or vinyl reinforced hose will be cheaper and lighter, but also more prone to damage and splitting. A rubber or rubber reinforced hose will be heavier and more expensive, but more durable. The choice is up to you! Ply: A hose can be made up of between one and six plies, or layers. The more plies there are, the stronger your hose is, but more plies mean less flexibility and more weight. Again, the choice is yours! Housing: Some hoses come in plastic housing for storage, you hose can be wound and unwound in the same way as you use a traditional extension cable. This is great for those looking to store a hose in a smaller space. Brass Fittings: Brass connectors are very durable and will last much longer than plastic ones, however, they can be difficult to undo once screwed on, so keep that in mind if you’re lacking in hand strength. Collars: A high-quality hose will come with a collar, a plastic or reinforced rubber section that extends from the connector down to around four inches or so. This prevents splitting close to the tap, which is a common problem with hoses. Attachments: Some hoses come with accessories, usually including things like a sprinkler or spray head that mean that you can water your garden in different ways. These are usually a little more expensive but can be useful if you want to do more than just pour water on your plants. Anti-UV Layer: Some hoses feature an outer layer that’s designed to protect the hose from UV rays. This will help your hose last longer if you plan on leaving it outside in the sunlight for long periods of time. Draining: A hose should be drained after use, simply pick it up from the connector and hold it high above your head so water can drain out, working your way down its entire length. Water left standing in the hose can grow bacteria or algae, or can cause your hose to split once you wind it up again. Storage: Your hose should be stored inside when possible, or out of sunlight at the very least. Sunlight and heat will cause hose material to harden and crack. Un-Connecting: Once you’ve finished using your hose, best practice dictates that you should unscrew the connector to the garden tap. This will prevent bacteria growing around the connection, water leaking into the hose, and connectors becoming rusted closed or cemented by limestone. You should now have a fair idea of the kind of hose that you’re looking for, so which model should you go for. We’ve got plenty of recommendations for the best garden hoses on the market! Before we give you our top selections though, how did we go about deciding which models to include? Well, we dismissed commercial grade hoses, since they’re really unnecessary for most household gardeners. We looked at affordability, of course, as well as what features hoses offered. Obviously, we looked at quality, dependability, and reliability. And we looked for great customer reviews and buyer feedback. 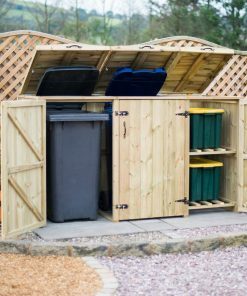 Though we do primarily sell bin stores, we spend a lot of time around gardeners, landscapers, and gardening professionals, so we got plenty of feedback from the pros and the sort of people that use garden hoses every day. Now, time to get on with those recommendations. Which hose is right for you? One of the below should definitely fit the bill! This medium duty hosepipe is a great choice for absolutely anyone. 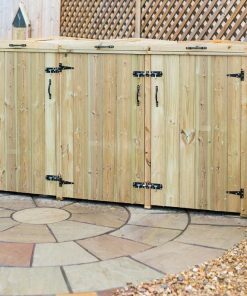 It comes on a pre-assembled wheeled cart, making it easy to store as well as easy to transport, and at 50 metres, this should be more than long enough for most home gardens. The cart handle can be raised and lowered, and wide tyres make pulling it a breeze. The hose itself is a medium duty, so fairly robust, and at 12.5 mm is the perfect diameter for most connectors. All in all, a convenient one-stop solution to your hosepipe needs. On the negative side, there are no connectors included, so you’ll need to buy your own. However, this does give you the opportunity to buy high-quality brass ones. There’s no anti-kink tech here, but that cart should help minimise kinking. If you’re looking for an expandable hose, this Running Bulls model is an awesome buy. It expands to up to 50 feet and features not only anti-burst and anti-leakage tech, but also a full year-long guarantee against bursting or leaking. It’s lightweight and expands to three times its size, making storage and use easy. Plus, it comes with a seven setting spray head attachment, giving you options from misting to jet spray, so something for everyone! Connectors are included in this model, and this hose is suitable for 1/2’’ and 3/4’’ connections. On the downside, connectors are plastic, which could be a deal breaker. And as with most expandable hoses, you’ll need good water pressure to use it, so this might not be the choice if you don’t have a full flowing garden tap. This is the only sprinkler hose that made our list, and with good reason. This is by far the best choice when it comes to sprinkler hoses, and at 15 metres is longer than nearly any other option. Better still, it even comes with connectors that can be used to extend it further if necessary. This is a flat hose, giving it two uses. Placed with the holes on top, it emits a fine spray of water upwards, placed with the holes downwards, it sprays water into the ground. It’s durable and comes with a full ten-year guarantee, as well as all necessary connectors (in brass), plus an end cap to seal off the furthest end. The only real downside here is that like most flat sprinkler hoses this is less durable than a regular hose pipe, and may split if water pressure is too high or if left in direct sunlight and switched off for too long. However, the same applies to any hose in this category. For those with a smaller garden, this compact medium duty hose is the ideal buy. It comes in at ten metres, and is in an enclosed plastic housing, making storage and transport both easy. There’s a carry handle, or alternatively a wall bracket so you can mount the hose box on the wall. The housing also allows you to clip on all accessories for easy transport. Connectors are included, as well as a spray head. There’s also a water flow stop cap to stop water as soon as the hose is reeled up. This is a micro hose, so narrower than most, and is suitable for 1/2’’ and 3/4’’ connections. However, this isn’t the hose if you have a larger garden since it’s just not long enough. And whilst that housing does help prevent kinking, there’s no anti-kink tech to stop it kinking once the hose is unwound. Plus, those connectors are plastic. If you’re looking for a regular hose that has easy storage for a medium sized garden, then look no further. This Hozelock model is housed in a plastic box that allows you to wind the hose in and out and is designed to be wall mounted, making storage a cinch. The hose itself is 20 metres, so perfect for the medium garden. It features anti-kink tech making it more robust. It comes with all connectors, and the spring-loaded winder lets you easily retract the hosepipe. The box can easily be dismounted for indoor winter storage, and there’s an auto-stop feature to stop the hose winding itself back in (and so you don’t need to hold it taut). There’s even a five-year guarantee. Note that there is also a 40 metre model of this hose, though that’s probably too long for most gardens. However, there are no attachments offered here, and connectors are plastic. Other than that though, for a basic hose with storage, this is a great option. If you’ve got a large garden, then this premium expandable hose is really the best option that there is. It’s expandable so storage is easy, there’s no kinking, and it’s lightweight too, and at 100 ft it should be a good choice for most. Plus, all connectors are included and are in brass too. There’s a sprinkler head included that gives you eight different watering patterns, from soaking to misting. And it’s super resistant with double latex inner layer and woven casing, meaning no bursting even under high water pressure. It even comes with a money back guarantee. The only real downside here is that this hose does NOT connect easily to other garden equipment, such as power washers since the end connector (not the tap end connector) is non-standard. And this is the only soaker hose to make our list, again due to its length, which is longer than most other models. This 25-metre soaker hose can be buried underground and is guaranteed for two years. It’s perfect for establishing flower beds or vegetable gardens! It comes with connectors too. The package includes a tap connector, and end stop (to prevent water leaking from the far end of the pipe), and a male connector that will allow you to extend the hose with more hoses if necessary. The downside is that all connectors are plastic, rather than brass. Plus, you will probably need a regular hose as well to make the connection from the tap to the soaker hose (unless you want to bury the soaker hose right next to the tap). If durability is high on your list of must-have features, then this is going to be the hose for you. This knitted material hose is super durable even under high water pressure and comes with a stunning 30-year guarantee. It’s 15 metres in length, which should suit most gardens, and has anti-knot and anti-twist tech, to keep it straight. It’s very flexible and easy to roll up, and does come with connectors. The end nozzle connector is ergonomically designed and made from a soft material to make it comfortable to use. On the negative side, connectors here are plastic, and though its flexible, this isn’t an easy hose to store (there’s no winding gear, no housing). But if you want something solid and long lasting, this is a great bet. Finally, if you’re looking for a great starter set, then this Hozelock set is ideal. It comes with a 30-metre medium duty hosepipe that should be more than appropriate for most standard gardens. It has a 4 ply braided material, making it durable and less prone to kinks (though there’s no serious anti-kink tech here). It does come with everything you need to get started, including tap connector and a connector to extend if necessary (or to connect other equipment such as power washers). There’s an included nozzle too, which allows you to control water flow and more accurately water. Plus, the hosepipe is UV protected and frost protected as well. However, all those connectors are plastic. And some customers have reported that kinking is a problem. But if you’re looking for a budget-friendly starter hose for general work, this is a fantastic choice.